It would be easy to travel to a new place and observe the style of its citizens, but it takes being fully immersed in a new place for several months in order to see your own style change and be influenced by your surroundings. This is exactly what happened after half a year living in Europe. 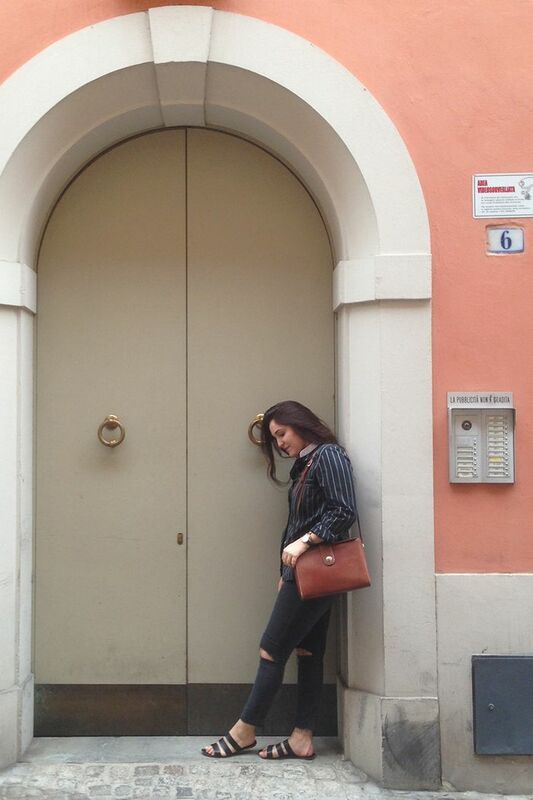 As a college student, I was lucky enough to have the opportunity to study abroad, and I'm about to share with you a few key European style lessons that my semester living in Italy taught me. After traveling the length of Italy—from Milan to Sicily peppered, with a few jaunts to France, Germany, and Switzerland—I observed exactly what makes European style so good. I took note of the way my Italian friends always carried their belongings around in a classic leather handbag and invested in similar staple pieces. After living abroad, I took the following six style lessons to heart—and promised to never make my old fashion mistakes again. At home, I was used to throwing all my daily belongings in a slouchy tote bag and running out the door. But while in Italy, I quickly learned that opting for something more polished (but no less roomy) made a world of difference in how put-together I looked. Though you may have taken to heart that an all-black ensemble is foolproof, I happen to disagree. All the stylish European women I spotted on the street knew that layering colorful accessories over their neutral outerwear creates a multidimensional look in the fall and winter. This was one of the most crucial style lessons I learned from abroad. I realized exactly why European women are known for their good style, and it has to do with their reliance on timeless pieces. I took note of their clothing choices and wisely invested in pieces like blazers, loafers, and black jeans that I now wear on repeat. On the whole, I observed that European women don't dress down as much as their American counterparts. I rarely (if ever) spotted leggings or track pants on the street, although classic white sneakers were definitely a favorite. Europeans simply choose to style their sneakers with more elevated ensembles, and I quickly followed suit. Instead of piling on bulky layers like puffer coats, I noticed how my European friends wore slimmer coat silhouettes that allowed them to remain polished despite the winter chill. Unlike back home in the States where I'm used to driving everywhere, I rarely stepped foot in a car while in Europe, so I learned right away that my shoe choices were of much consequence. I favored lower heel styles like kitten heels and block heels whenever I wanted a little lift. Next, see the Mary-Kate and Ashley Olsen outfits I copied.